Fancy Skiing In Zermatt This Christmas For Less Than £1,000? Home / Flights / Frequent Flyer Programs / Fancy Skiing In Zermatt This Christmas For Less Than £1,000? 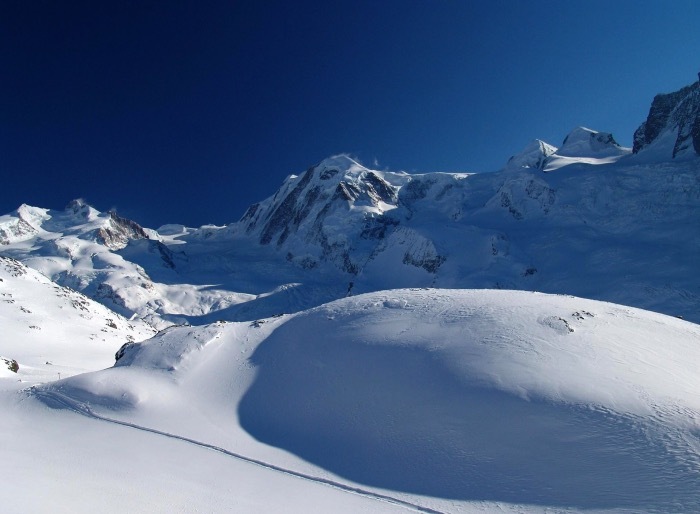 If you are a ski addict, you will likely know that Zermatt is one of the in places to go! With over 360 km of pistes, incredible scenes like the one above, pumping apres-ski and the cutest village EVER, it ranks as one of the very BEST ski resorts in the world. Of course, that does not make it a value destination. When celebrities, royals and billionaire business men flock there in their droves, rooms start from £154 per night on hotels.com for the Christmas period this year. The average is well in excess of £200 a night, with top properties selling for over a £1,000 per night. Ouch! Of course, that is before you even think about indulging in all that this chocolate box village has to offer. Food and drink in Switzerland is notoriously expensive so wild nights out may be a wistful idea, unless you happen to win the lottery before your visit. My first experience of skiing was in Zermatt, twenty years ago. I was fortunate enough to qualify for a work incentive, for top rookie of 1997, and won a fully expense-paid weekend to this heavenly destination. Little did I know, that the inclusive ski lessons, luxury five star hotel and services of luxury operator Scott Dunn probably cost more than a few months of my salary at the time! Since, then I’ve considered returning on many occasions, but always thrown in the towel in defeat after seeing the ridiculous cost of a weekend stay. Suffice it to say then, I was pretty excited when I discovered an alternative way to visit which doesn’t cost the bank. Just follow this three step plan for your own budget version of skiing in Zermatt. I booked flights in the EasyJet sale, for a total of £252 from Manchester to Milan. That includes flights for myself and Jason and three bags, after all we have ski boots and helmets to ram into our cases. Normally we would carry boots in separate bags, but if it saves £40 on carriage by combining them in one case, so be it! This is where you need to get creative. No way are you going to bag a bargain in Zermatt at Christmas! Not now, not ever! However those 360 kilometres of slopes connect three enchanting valleys, two of which are located in neighbouring Italy. Prices are much more affordable there. You can take your pick from hotels in Valtournenche or Cervinia (from £63 per night), hop on the nearest ski lift and soon be skiing down into Zermatt. Just be sure not to miss the last life back from Zermatt or you might be paying for a very expensive taxi. After all that little mountain hop is a drive of over 200 km! Cervinia still comes out more expensive than Valtournenche (beware, some of the cheapest options are some distance from the village on hotels.com). If you stay in the smaller settlement of Valtournenche, prices drop remarkably, but it still connects directly into the Zermatt-Cervinia area. From Milan to Valtournenche, it is a four hour plus journey, but who’s counting when you will be greeted by stunning mountains every step of the way? The bus links you to Chatillon train station, from where you take a train to your final destination. All the timetables can be found on Rome2Rio (a truly awesome site for finding your way around) and with prices starting from £13 per person (each way), this is a bargain. Y0u can also book a shared minibus direct from the airport for two people, for €90 each way. My total cost for a week from 24th to 31sr December is £957. I will be heading back to Milan to celebrate New Years Eve and where better to celebrate? Anyone who has ever witnessed a fiesta in Italy knows that the Italians are the master of incredible firework displays. I simply cannot wait! Also if you have any top tips for bargain lift passes, or great value bars and restaurants in the area, be sure to pop them below. So true about all these points! you will realize that Zermatt is just absolutely jaw-dropping. Yes, I definite would never have learned to ski without winning that. I was fresh out of uni and was too broke! I love Zermatt but have only visited for summer hiking. EasyJet has excellent fares – great suggestion. What are the lift prices like during the winter? Skiing there would be fantastic. Surprisingly not as expensive as i thought. Less than what I would pay for a week in the States and a huge ski area! I will be spending Christmas and New Years 2017 in New Zealand. I’m so excited! This skiing in Zermatt looks amazing. I’ve been to Switzerland, and I know you’re right about how pricey it is, so these tips look really helpful. I have never been skiing, partly due to the excessive cost! If I’m brave enough to face the cold and risk of broken bones then it’s great to know it doesn’t cost the earth! And it does look GORGEOUS there! Such useful tips! It’s unbelievable save so much money by just using the right steps. Although I’m absolutely not a wintersport person (I cannot ski at all, haha), from photos it just looks like such a breath taking place! I would love to go there, to hike a bit and to enjoy the perfect views! Zermatt looks like a great place to ski! Thanks for the tips and the price break up. How much do ski lessons typically cost in Zermatt? And equipment rental? We have taken one beginner ski lesson in Iceland. Definitely need a lot more practice! I’ve always wanted to visit Zermatt–it looks like such an adorable town! Skiing there in the winter would be so much fun. Nice job on the deals you found–makes it even better when you can save some money! What an amazing place to ski ! How wonderful to be able to keep going back too. As usual, you’ve outlines some wonderful tips for some people to take advantage of. I’ve just recently booked some flights with Easy Jet myself. I always end up on the not so cheap side though because of all the luggage I have to carry around the world. This is such a great guide to skiing at a nice place. I find skiing to be overwhelming because of the cost but seems like I just need to prep. By the way, that village at nighttime is adorable! What a sight. I’m not a skier but Zermatt looks like a great winter trip spot. As a hiker, I wonder what hiking in the summer is like. I am pretty certain it would be stunning. The last time I visited was many years ago but let me tell you, those views of the Matterhorn or imprinted on my mind as possibly the most incredible mountain views I have seen. Go for it. Thank you for writing this! Zermatt looks like an absolutely magical place to visit and great to know it’s possible to do so without breaking the bank. I can’t think of a better place to spend Christmas. I’m pretty much a rookie when it comes to skiing, are there good slopes for beginners? LOL, next season! My friend worked there as a ski rep this season and I promised to visit. But it all looked way too expensive! Now if I had a grand I would go. I went to Zermatt last year for a week and came back suffering open wallet surgery. Would love to do this in the winter months, looks amazing. Excellent tips! I would say that loads of people haven’t even considered doing the mountain hop like you guys did. But you’ve made it all seem so possible, and cost effective to get to a higher priced fancy ski area! We are also already thinking about Xmas and New Year too, and I totally agree that time flies quicker as we get older. I have never been skiing but this looks amazing! Thanks for the great guide! Zermatt was the first place I skied and it was an incredible place. Unfortunately my skiing didn’t quite live up to the destination so I’m super excited to be returning!